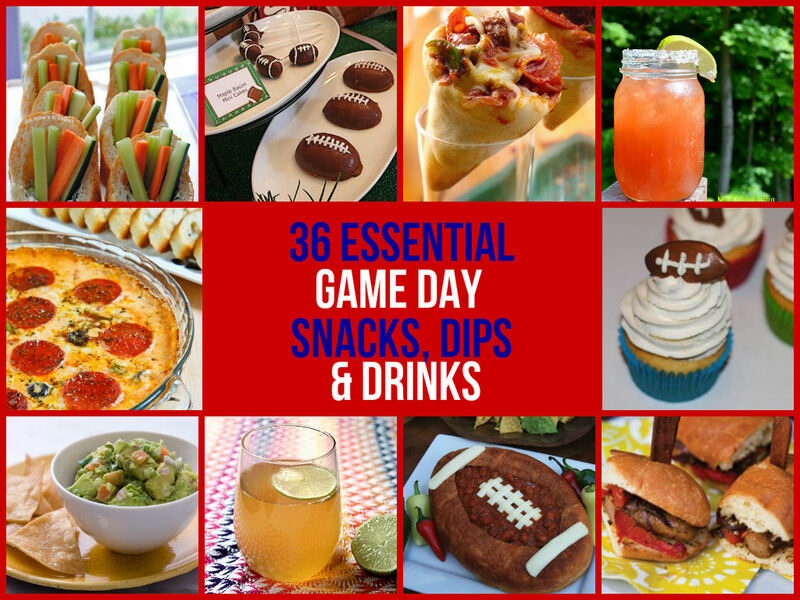 If your heading out to the game, then some of these recipes are perfect for tailgate snacking too. 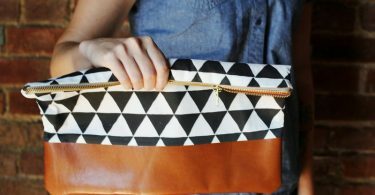 We have searched high and low and shared our favorite recipes so you can rustle up some of these in time for kick off. Baked Buffalo Chicken Nuggets – A healthy alternative to fried chicken – but still tastes incredible. Chicken Chilaquiles – A perfect snack – crispy hot nachos with a melting spicy mix smothered on top. Buffalo chicken ring – An inventive recipe that is sure to impress any game watching mates. White Chicken Chili – A superb alternative to a heavy chili, this is a refreshing take on the traditional dish. 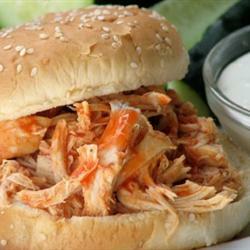 Slow Cooker Buffalo Chicken Sandwiches – a spicy and hearty sandwich perfect to munch on during the game, why not add some cheese on top? Sausage-and-Pepper Heros – A great mix of peppers and sausages – it will feel like you are there. Pizza Cones – A portable no-fuss snack great for people wanting that pizza fix. 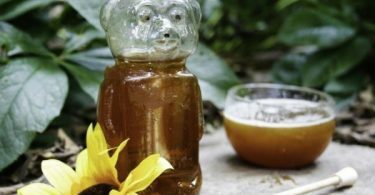 Kielbasa Bites – Tasty sausage and ginger ale – not a typical pairing – but the results will be surprising. Mini Loaded Potato Superbowl Footballs – It’s easy to make this a meaty snack by swapping the veggie bacon for meat. 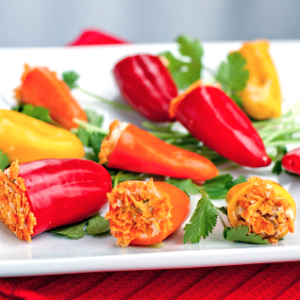 Chorizo Poppers – These sweet peppers stuffed with sweet and spicy choizo is a mouth watering snack ready to be enjoyed on game day. Touchdown Meatloaf – Get the kids involved in this fun and playful meatloaf – sure to be a hit with hungry tummies. BBQ Beef & Cheddar Crescents – These are quick and easy to make but taste delicious. Ultimate Game Day Chili – This is a great comforting filling dish you can enjoy in the comfort of your own home. Superbowl Party Nachos – Most of the these ingredients can be found in your pantry – just waiting to be used! Blue and Black Burgers – Make these tasty burgers for you and your friends to enjoy with a nice ice cold beer. 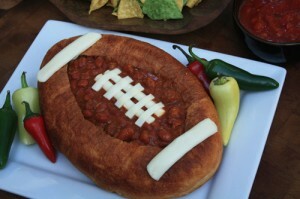 Chili Recipe in Football Bread – A real show stopper and great if your hosting, why not impress your guests? Fried Cheese Dippers – A hot, cheesy stick with a crunchy baked coating, perfect for dipping in some hot sauce. Deviled Eggs – Make these ahead of the game for a perfect snack whilst during to the game or even in the comfort of your own home. Veggies in Baguettes with Spinach Dip – This is a clever way to spice up the veggie snacks on offer and make them look more appealing. Coach Stylz’ Healthy Jalapeno Poppers – A healthy alternative to the traditional calorific poppers. Baked Brie Bites – These cute lolly pop bites are so tasty – who doesn’t love pasty and brie – a perfect combo. 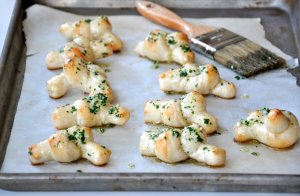 Garlic Knots – Grab a garlicy soft moist bread bite and dip away. Buffalo Chicken Dip – This sauce would go brilliantly with some crispy fried chicken. Strawberry Mango Salsa – This salsa would go perfecting on sweet or savory snacks – its so versatile. Crab and Avocado Dip – A fishy dip which would go great with crispy tortillas. Guacamole – A perfect dip to go with some spicy foods – brilliant way to cool the pallet. 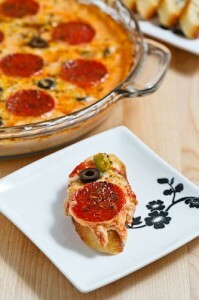 Easy Pizza Dip – A delicious finger licking dip ideal with bread sticks or flat breads. Graham Nut Clusters – You can make these in advance and store them for up to 5 days for hassle free food. Maple Bacon Mini Football Cakes – The ultimate guy dessert, they taste just like pancakes with bacon and maple syrup. Football Shaped Whoopie Pies – These cute playful pies would look great if you happen to be entertaining on game day. Frosted Peanut Butter Football Cookies – It’s always a good idea to have something sweet on hand to balance out all the savoury foods involved on game day. 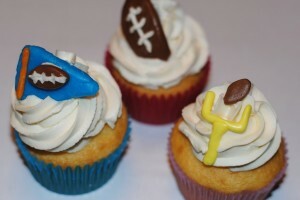 Super Bowl Cupcakes – Test your baking skills with these super cute cup cakes – a great recipe to get the kids involved. 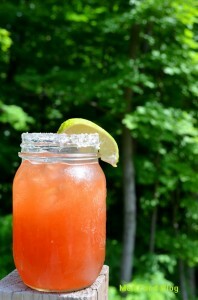 Michelada (Bloody Beer) – This warming Mexican drink is a perfect match for all your spicy foods on game day. Ultimate Margarita – A classic cocktail and a great alternative to beer. Cousin Funday Beer Cocktail – Bright bitter and crisp this wonderfully refreshing drink is a real treat. Bubbly Manhattan – What better way to celebrate than with a fantastic bubbly cocktail.